Before investing time and having a lot of frustration with this 'solution' you could consider an alternative command station. Building any of the published electronic circuits related to DDX are at your own risk and are not supported in the Rocrail Forum. Supports both the NMRA DCC and the Märklin/Motorola (MM) format. Up to four s88 chains on the parallel port. Without protocol overhead for better response time. 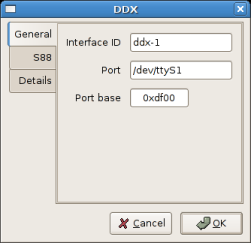 DDX is not able to deliver the quality of real Command Stations and problems can be expected using it. The UART of the PC is not designed to generate signal that fits 100% to the NMRA standards. Due to this there are some decoders which are not working or partial not working. S88 is not 100% reliable because of the long wires between the chips which is not covered by the specs of the manufacturer of the chips. Mobile decoders could react delayed on commands generated by DDX. The s88 chains, up to four, are connected to the parallel (printer) port. 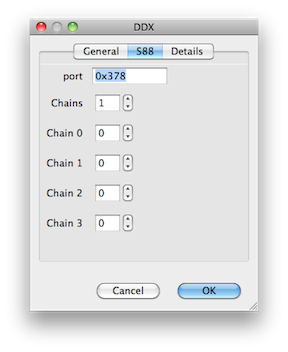 All chains are parallel scanned, so distribute the sensor modules over these four ports for better performance. All parameters are possible to set from Rocview. If the LPT is connected to the ORD-1 the PT must be activated before programming. See: PT ON/OFF. Advised is to program the locomotive decoder, CV29, to run only in digital operation. Under certain conditions the track power is still high without digital modulation which will let run the locomotives in conventional operation if the CV29 is left to its default. First of all you have to tell the loco decoder that he has to listen at 28 / 128 drive steps. So let's program Bit 2 of CV29 with the Value 1: CV29 = 2 After that we have to tell Rocrail how to send data to the loco. 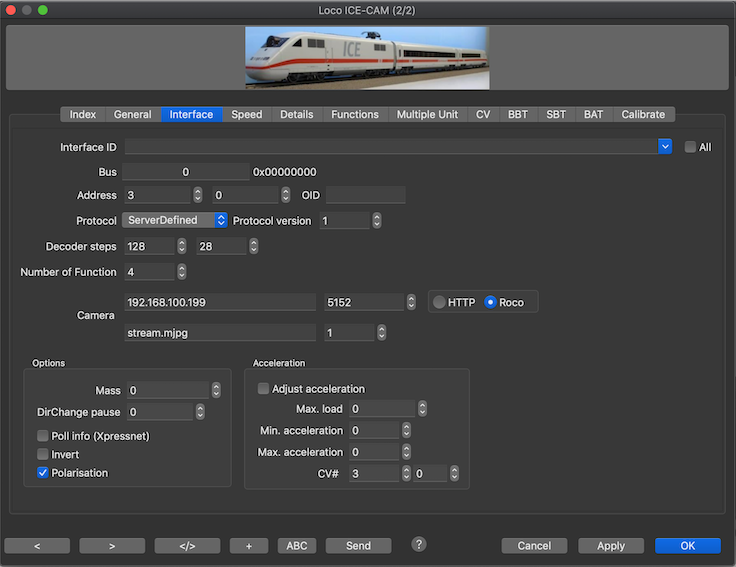 Klick on Tables-Locomotives and select the loco you want to change. Klick on the Interface Tab and change the following settings: 1. Protocol Version: You have to change the protocoll Version from 1 to 2 because Version 1 supports only 14 and 28 decoder steps. 128 steps are availible with Version 2 only. 2. Decoder Steps: here you have to select the decoder steps. Insert 128 for a smooth driving locomotion. Some Lenz decoders may only able to recognize 14, 27 and 127 steps. Be sure that your Decoder is able to handle 128 speed steps. If you're not ask your local Dealer or the manufactorer of your Decoder. This was tested with SNAPSHOT svn 704 and DDL.so. It was also tested with erddcd-v1.61-svn254 and SRCP V0.7. Do not use with SRCP 0.8.x because it means long addresses instead of 128 speed steps! When using DDL you must program the locdecoders to ignor analog signal. Mostly CV29, but check your decoder manual! For best result, use legacy serial port, i.e. ttyS0-4 (Linux) Com1-4 (Windows) on address 0x3F8, 0x2F8, 0x3E8, 0x2E8. If the address is none standard it can be overwritten by setting the Port base to the one reported by the OS, in all other cases leave zero. It may work with USB2Serial adapter. To work properly for Märklin/Motorola protocol, the USB2serial adapter used must support 6-bit transfers and support reporting when Uart transmitter is empty. Windows may take long time to change between DCC and MM Uart settings, this will create pauses in the data stream, which will make the lights flicker (if used only for DCC or for MM, no such changes is needed). From rev. 2386 the dialog support the input of all possible port addresses. To disable S88 completely set the port address to "0". To use the parallel port under Unix-like operating systems, rocrail server has to be run as root. For LPT in the BIOS setup the Plug and Play must disabled and the ECP/EPP mode must be set. Check this option when using a real RS232 interface to get a faster CV reading. Reduce light flickering when using a real RS232 interface. Note: Before svn 2483, please have all enabled. Make sure that the used RS232 serial port is suited for generating an accurate digital signal; Not all ports can handle the demands. To use the full and unlimited features of DDX under Unix-like operating systems (also under Linux), rocrail server has to be run as root. GIVEIO.SYS device driver. The link leads you to an description on how to load the driver into the system. By using Windows7 (32bit), you have to install the device driver in safe mode. The MM format needs special timing which uses busy wait loops to achieve the precise timing needed. On Windows, the high resolution timer is used. On Linux, nanosleep is used. Those timing functions requires hardware found in Pentium processors or better (486 will not work…). The command latency for a single command issued when idle is approx 0-50ms (it may have to wait for a refresh packet (25ms) and idle data (25ms) to end). DCC only, one loco is refreshed approx every 50ms. MM only, one loco is refreshed approx every 375ms (this requires 5 packets, 1 speed and 4 FX packets, 25ms idle data is sent between packets). DCC + MM, one DCC loco and 25ms idle data is sent between every MM refresh packet. A complete MM loco refresh cycle will then take approx 500ms. If only the MM protocol is chosen, so occures a high CPU load or the PC is slowing down. Some users are reporting that this is solved under Windows by additional activating the DCC protocol. This software module, as well as the programs SRCPD and DDW, are descendants to erddcd (aka. Digital Direct for Linux). Hardware that works with erddcd, SRCPD or DDW will work with DDX. The programming track control and feedback is tailormade for ORD-1, but may work with similar hardware. The old S88 interface for MrDirect is not compatible with DDX (but recent versions of MrDirect supports our kind of S88 interface). 1 255 15 0 Very old decoders, no absolute loco direction. Only 80 addresses are supported by legacy Märklin decoders. 2 80 15 4 Safe bet for most MM-compatible decoders. 3 255 28 4 Newer decoders (MFX+MM) seems to understand the 28 speed steps. Also used for Wikinger decoder. Both short and long addresses. 14, 28 and 127/128 speed steps. This list is user defined and does not guarantee that it works 100%, and there is no official support in the Forum. On the long run some decoders could have problems with the digital signal quality. If the decoder does not react on commands it could be fixed by change pole. The output of the ORD-3 is electrically different compared with the ORD-1. Under Win 8 trouble is possible, if a booster needs the RS232 handshakes DTR and/or RTS. The forum thread http://forum.rocrail.net/viewtopic.php?t=6623 provides notes.